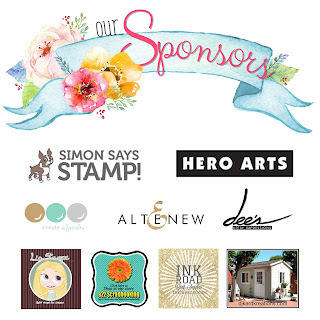 Monica's Craft Corner: CASeing Kelly blog hop! If you are hopping along with us you should have came form Michelle Williams. and the fading of color from one side over the stencil, love it! Here is my card, I felt the sentiment was appropriate since Kelly is someone I admire in the card making community! Thanks for stopping by on your hop adventure! You should head to Niki G. blog next to how she's been inspired be Kelly! This is a perfect CASE! I can so see Kelly in this card. Love it! What a wonderful case, love your sentiment choice and the fall theme! 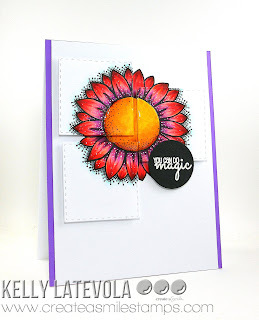 Fantastic case of Kelly's pretty cards! I love how clearly I can see the influence of Kelly's cards in yours! A fantastic mix of Kelly's inspiration! Love your card, Monica! Gorgeous coloring and design! I love how you were inspired by Kelly! Oh, this is so fun! Great CASE of Kelly's work! cool, love the squares. and your coloring is really good! Perfect CASEing of Kelly's work. Love the squares on the flowers. Thanks for sharing. The sunflower is gorgeous! I love how you CASEd the layers! I love the inspiration you got from Kelly. Your card is so beautiful! Love your CASE card...the flower is gorgeous. WOOHOO! Fantastic JOB Monica.....I'm sure Kelly will love it and LOVE the entire hop! Not sure why, but many of the links in the BLOG hop take me to another blog (Not yours)...I found this link in the a2z GROUP on FB? So happy I could see your card here! WoW, what a GORGEOUS card! What a terrific TRIBUTE! Beautiful card, great CASE of Kelly! Monica love what you did with combining Kelly's work. Very pretty details!! Your card is such a pretty one! Great case of Kelly's style! Love that stenciling - lovely! what a fun card! the spotlighting is done PERFECTLY! You really did a great job with this card Monica! oh this is so pretty, and such a fabulous case. Cool card, and the perfect sentiment! I am so enjoying this hop, especially seeing what cards each of you has chosen to CASE, there are several that are appearing again and again, with good reason. I adore hoe you did the panel with your flowers, the whole card is simply beautiful and a wonderful CASE! Thank you for being part of this hop ho orang Kelly, I think she is not only awesomely talented, but a terrifi person as well and it is so nice to see her being honored in this way by all you talented women! Great card. It's been fun seeing what cards people have chosen to CASE. Monica, your card is gorgeous! I LOVE that bold flower! 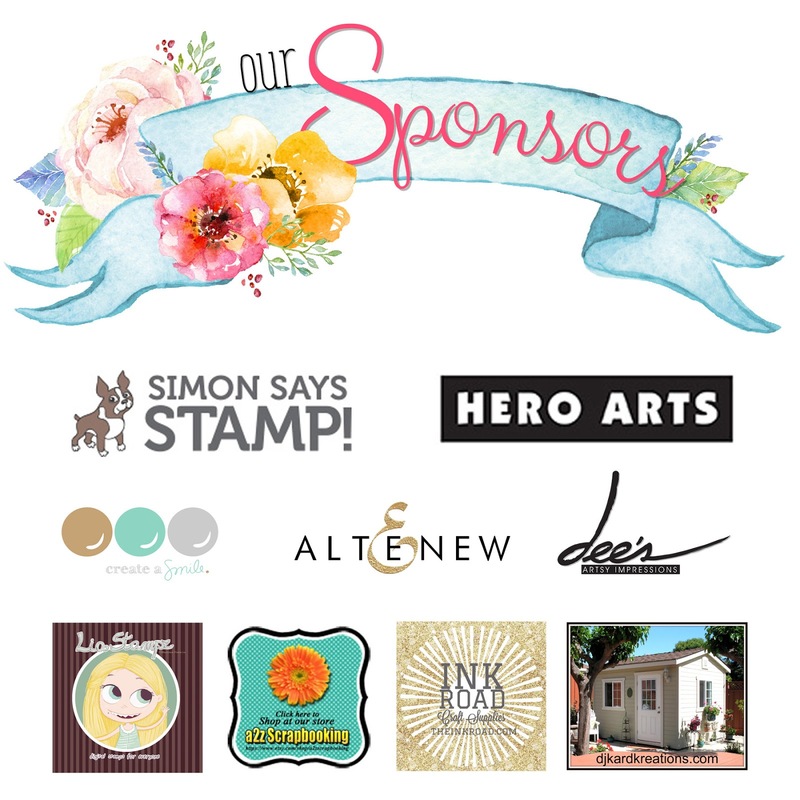 Such a FUN blog hop and inspiration, just like YOUR Case Card is! 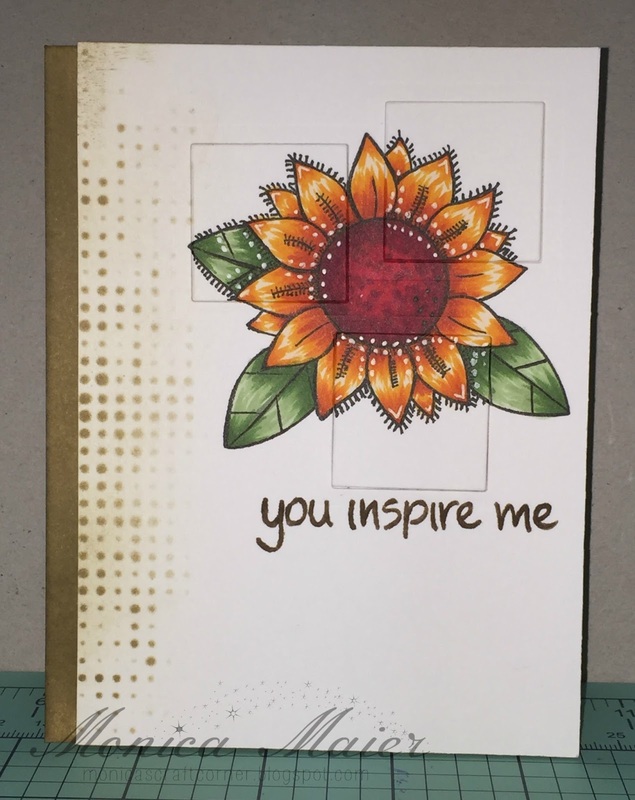 I love Sunflowers and Your card is AMAZING...Awesome coloring and Your choice of sentiment is Inspiring as well. Thank you! What a lovely large flower all done up in fantastic coloring. SUPER CASE of Kell'y card! LOVE the pop up squares and stencil work. Great card! Love the color on the flower! Fabulous card! Love the paneled sunflower, what an amazing look! Beautifully colored! Oh I love this card...subtle background and sunflowers! Lovely card, and you case-ed them all perfectly. YOUR CARD IS GORGEOUS and so INSPIRING!!! I love it - so well done and such an excellent CASE!! You are awesome!! What a fantastic card Monica! I love the coloring and the stenciling! Awe, Monica, this is gorgeous. Love the bold flower! The fading of color looks great with this pretty flower! Oh this is so cool. That flower is fabulous with the cut outs!! What a fabulous CASE! Awesome job! !